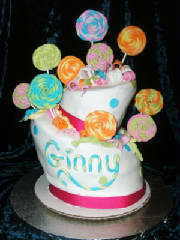 This lollipop cake is made up from two eight inch layer cakes for the top and the bottom is made up from two twelve inch cakes. Don't be afraid of the cake because it's easier than you think. For both layers of cake ice and stack your cakes the same way you would for any other stacked cake. Then put both of them in the freezer for only 15 minutes. This will get the icing to firm up so that when you go to cut it, it won't crumble as much. Once you take them out I eye ball where I want to cut then but put tooth picks into the cake all the way around where you want the cut to be to help guide you through the process. Make sure that when you do this you leave at least a good 1 to 1 1/2 inches on the bottom untouched by the slanted cut. This will give you the height in your cake and make it look really great! Once you have this done and you like the placement of the tooth picks take a long serrated knife and cut where you have the tooth picks. Do this for both sets of cakes. Once you're finished coat your now wonky cakes with icing to get a good clean slate for your cake. This is where you are unlimited in options. You can put colored butter cream here or go the way I did and use fondant. From this point it gets even more fun! Take several different colors of fondant; which can be achieved by using your cake gel colors. Once you have several different colors take about the size of a half dollar of a couple of the colors that look good together and roll them in logs about a long as your index finger. Then you lay them side side by side and continue to roll them together to make a longer log. Next, take that log and roll it up in a circle to look like a lollipop. Take a lollipop stick and push it up into the bottom of the circle where the final end of the log ends so that when it dries it won't show on the outer part of the lollipop. The same way you made the lollipops you can bend the log to spell out the name on the front of the cake. To stack the cakes place your bigger of the two wonky cakes on your cake base board or cake plate. Then for the smaller wonky cake make sure you have it on cake board and cut down to the same size of the cake. Now while your bottom cake is in front of you have about 6 cake straws by and place them in the cake where the top cake will be sitting and then trim them flush to the cake so that it will give the cake support and keep it from crushing into the bottom cake. Now that you have this part done you can take a little icing and place it down where the top cake is going to sit and then place the top layer on the cake but don't let go! Take some skewers that you would normally use for grilling and put them all the way through both cakes from the very top. This will pierce the cake board that's between the cakes and will offer them more stability. Once your done cut all the skewers flush. Begin to put all your lollipops that you've made in and around the cake and have fun with it!